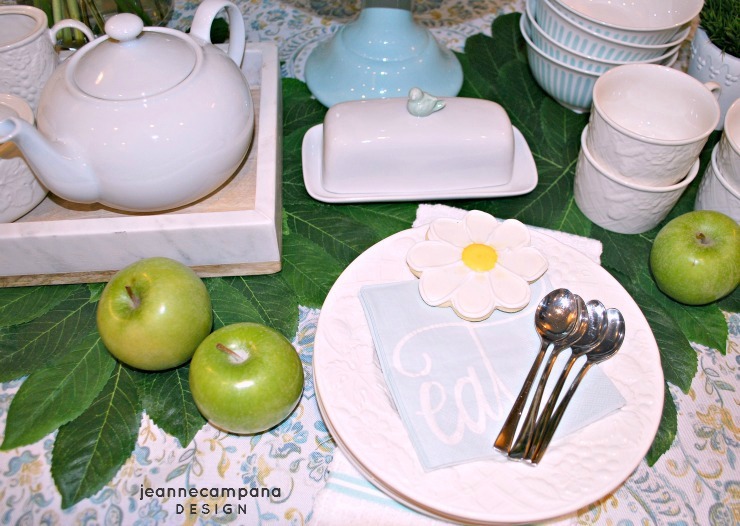 Creating this simple tea inspired vignette started with a trip to my local HomeGoods store where I found the prettiest patterned tablecloth with soft blues and bright greens. Spring is a great time to have fun with colors and although I tend to gravitate toward reds and oranges when decorating with color, these cooler shades are refreshing and unexpected. 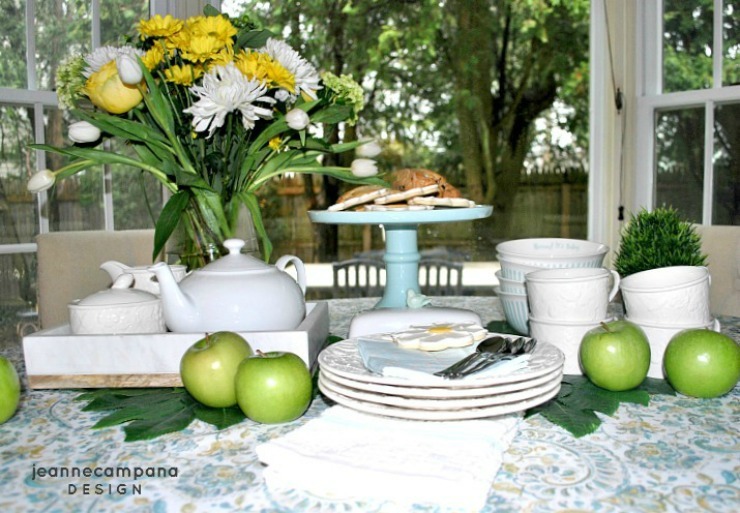 Layering elements is a great way to add style and dimension to any tablescape. 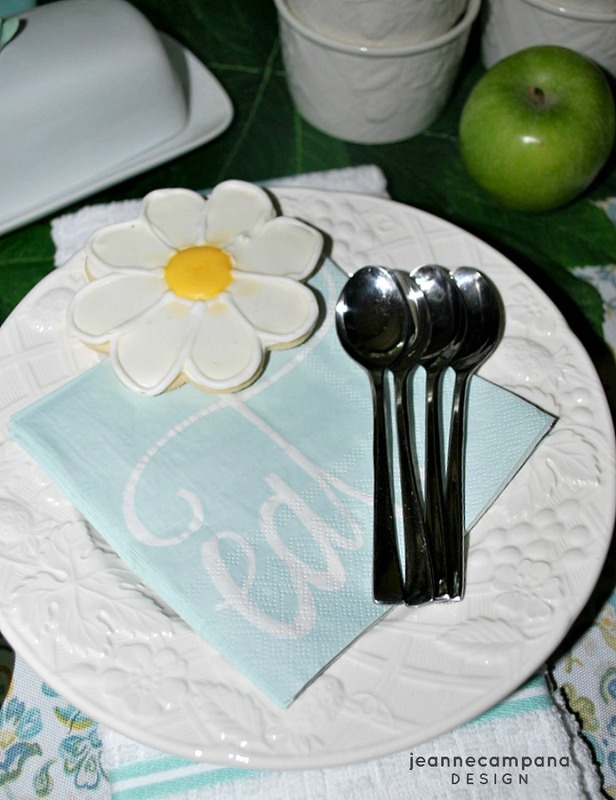 I added lemon leaf placemats from Pier One Imports for a fresh pop of greenery and my new soft pale blue cake stand and a sweet birdie butter dish added even more hints of color to my spring table. Brightly colored blooms are everywhere this time of year and fresh flowers are an absolute must-have for any spring tablescape. 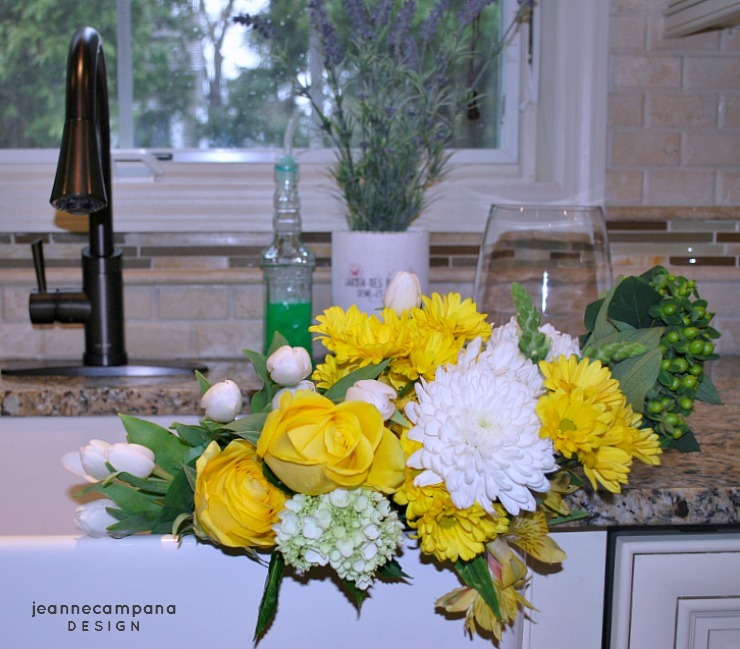 These yellow and white beauties caught my eye immediately and I knew they would be perfect for my vignette. 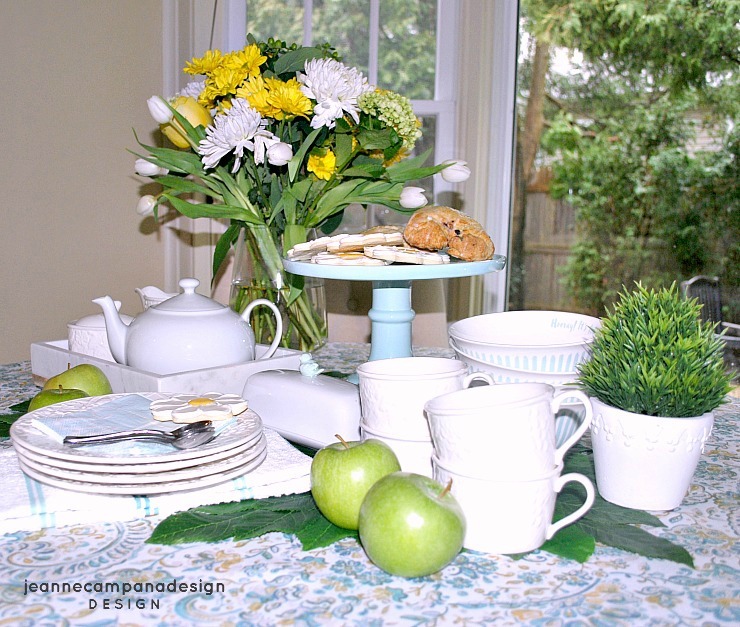 Finally, I corralled together white dishes and tea cups that I already owned, added fresh green apples to instantly brighten up my table. While visiting a local bakery, I picked up the most delicious scones and prettiest daisy cookies. 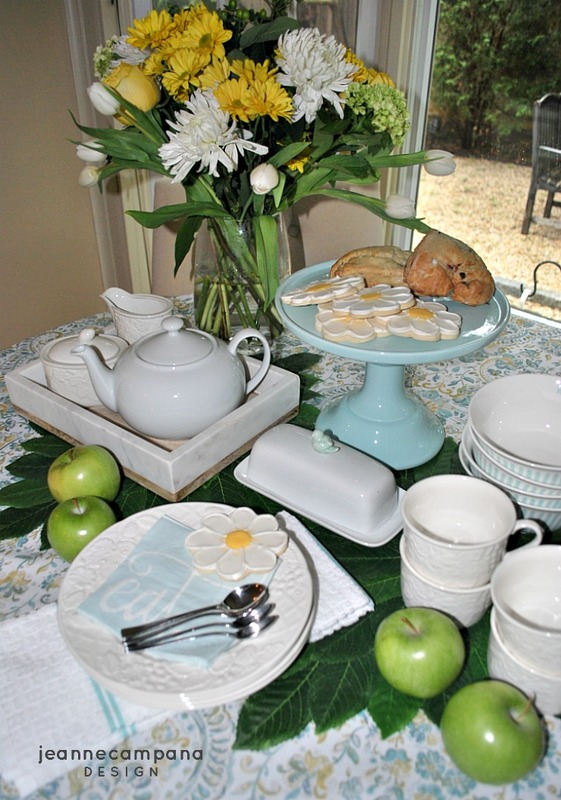 My spring tea vignette was complete. Happy Spring! Thanks for stopping by! What a darling set up Jeanne! THis was so fun to do together! I love the color scheme jeanne!! It’s so perfect for spring. Such a great post!!! I want to come for a tea party at your house Jeanne! You styled it all up so perfectly! so fun doing this spring tour with you! Jeanne! How fun and those cookies look so tasty! 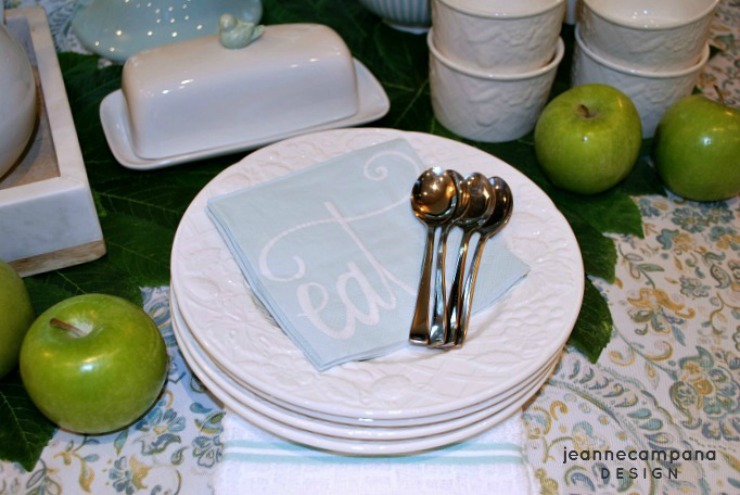 This post is making me so excited for warmer weather and entertaining! !